The sign of Scorpio already gives Sun a special task to find joy in the dark and might be serious and demanding as a gravity point one strives for. People born on the 10th of November need to connect extremes as pure as possible, becoming a beacon of light in the darkest of times and showing how serious the situation is when no one around them sees its true depth. It won’t be easy to find themselves constantly standing "on the other side" but their ability to stand out brings balance to their surroundings and this is something to be proud of. Depth given by Pluto among all these suns is truly important, as a beam of peaceful light in the midst of burning fire. 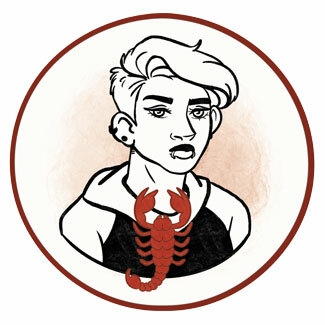 Scorpios born on November 10th have a special ability to understand the cycle of Nature, the loop of life and death in all its glory, and won’t really settle for anything superficial in life. Their image of Self may be extremely persistent, never allowing them to give up on who they know they are, but depending on their upbringing and possible trauma from childhood, they could also be torn into two or three different personalities that all need to find common ground. A surprise to everyone around them, often even to themselves, they could have a hard time adjusting to expectations of the world and go into extremes or dangerous situations in their attempt to feel like themselves again. They are deep and warm in their core, and although jealousy or obsessive behavior might limit their ability for contact, they are powerful, have a strong will, and shouldn’t give up on their inner child no matter the price that has to be paid. "A Path Through Woods Brilliant with Multicolored Splendor"
An incredible symbol marks their lives, with a strong symbolism of belief found in all its colors and the woods itself. The power of nature needs to be embraced and human interaction is often brought down to a minimum before they realize the magic and the possibilities of the world they were born into. There is wonder surrounding their time of birth, our connection to the Divine and the core of life's creation, combined with the essence of the Earth in all its simple beauty. As they evolve, they will find their still corners of magic where their batteries can be refilled and their creativity find the essence of existence they were brought here to share. With the purpose in lives of those born on November 10th found in the symbolism of Jupiter, it is obvious that they are to find the right calling and their true direction in life, opening their eyes to see the truth in any circumstances surrounding them. Their beliefs are to shape info positive thoughts leading them where they wish to go, towards peaceful and beneficent new things and expansion of mind and perspectives. They strive to get educated or gather knowledge and philosophies in different ways, and time teaches them that all the knowledge for the practical world they wish to conquer is already found in their heart if they listen to it closely. 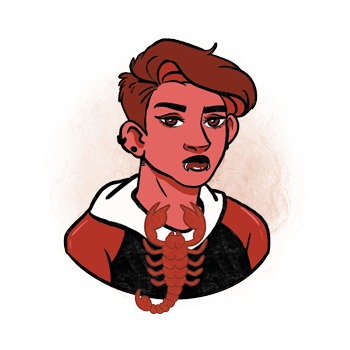 Feelings of Scorpios born on November 10th are a tricky topic to discuss, for we could anticipate lack of interaction from their planetary row, while seeing so much intimate bonding with Nature in all its colorful glory. They need to keep a smile on their face, which might be a bit difficult around people who are negative, burdened, and take their energy away. Choices of partner should be made such that there is laughter and light in their relationship, rather than simply sharing pain and making a home out of it. To create balance with another person, they need to make sure that they don’t forget their own worth along the way, and need someone who will truly value their opposing, seemingly upside-down nature, with enough laughter to color the bond. When they realize the quality hidden in their differences and the way they stand out, their talents will have a chance to truly shine and they will be inspired by a partner who sticks by them at this time. They could get a bit possessive, but for as long as truth is the pillar of their close intimate bonds, they will cherish each person that enters their life and remains loyal to the depth of emotions shared. A Scorpio born on the 10th of November is a magician, an occult leader, or someone bound to heal. They become excellent surgeons, psychologists and profilers, and turn into leading figures as time goes by and they start openly embracing their identity. They are powerful people with a tendency to turn things upside down, bring change into stagnant systems, and often work in taxes, loans and positions that others don’t want to take on. Open to be different, they can become quite popular doing what no one expects them to do. The stone to bring childlike joy into lives of those born on November 10th is Dalmatian jasper. It helps them break down walls and barriers they create to protect their frailty from the outer world, in a healthy way, rebuilding trust in their relationships. Allowing the obsolete things to go away and make room for the new, it will boost their creativity and make them feel happy for simply being alive. Relieving the tension in all bonds with others, it will lower one's need to take revenge on anyone who's done them wrong and let go of hurt that is no longer necessary. When choosing a birthday gift for a person born on November 10th, keep their childlike energy in mind. They can metabolize deep research and things that others might frown upon, but they still need light and joyous things in their life to feed them with positivity and the right perspective on relationships. Bring them a lamp, something that burns, or something to hang on their window as a prism or a shiny crystal to give them a rainbow of colors. They might enjoy a magician's set or something that will remind them of their hidden powers and talents they rarely share with the world. Powerful, deep and centered, they get to the core of each thing with ease and lead the way out of the darkness for those who got lost. They are healers and game-changers, those who will be there in the most difficult times and bring light into the world. Turned upside-down, they lose energy trying to fit in, and often get grumpy, turning positive occasions into dark, cynical moments. If they aren’t flexible and emotionally stable, they become deeply possessive, narcissistic and sometimes destructive or violent in their expression. In 1928 Ennio Morricone was born, an Italian composer, trumpet player and conductor, who composed over 500 scores for cinema and television, along with more than 100 classical works. Taught music by his father as a child, he entered the National Academy of St Cecilia at age of 12, enrolling in a four-year harmony program and completing it within six months. In 1968 Tracy Morgan was born, an American actor, comedian and producer, recognized as a cast member for seven seasons of Saturday Night Live. His father chose his name in honor of a platoon mate and friend who was killed in action when they were together in Vietnam. In 1969 Ellen Pompeo was born, an American actress who gained worldwide recognition for her role of Dr. Meredith Grey in Grey's Anatomy. When she was five, her mother died of a painkiller overdose, and she later stated that she thinks losing her mother at such a young age gave her a special appreciation for life. 1775 – Founding of the U. S. Marine Corps. 1951 – In the United States, direct-dial telephone service from one coast to the other, begins. 1958 – A New York diamond merchant donates the Hope Diamond to the Smithsonian Institution. 1969 – The debut of the Sesame Street. 1983 – Windows 1.0 is introduced by Bill Gates (born on October 28th). 1989 – The beginning of tearing down the Berlin Wall in Germany.